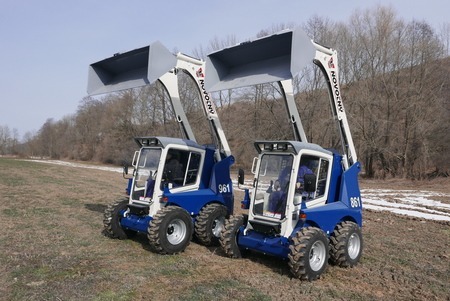 The "BOBEK" skid steer compact loaders have been designed to work in various fields of civil engineering and agriculture. Thanks to their high manoeuvring capabilities, these loaders find application at demanding work with terrain clearing, preparation of sites, loading and moving materials, excavation, lifting of loads e.g. pallets, etc. By means of a simple quick-clamping system, various attachment devices can be connected and disconnected quickly and easily, and thus the operating possibilities of these loaders - their utilization - can be enlarged substantially. When using the wide range of attachment devices available, these machines become really versatile. They can be used for excavations, removal of earth, terrain clearing, bitumen and concrete deterioration, lifting of pallets, straw or hay bales. The control is a unique advantage all types of the "BOBEK" loaders. All loader movements including the jib and bucket (and possibly another attachment device) control are assured by means of joysticks. The control is very easy; it does not require any enourmous force and thus the operator's fatigue from this activity is almost avoided. The original appearance is another feature of the "BOBEK" loaders. They feature rounded shapes of all machine basic parts, usage of plastic covers for the cabin hood and the engine compartment. The drive of our loaders have been derived from the Cummins engine through hydraulic system, pumps, hydraulic motors, a control valve and actuators delivered completely by Bosch Rexroth a renowned company in this field.